A special-purpose oil gauge designed for horizontal application where a fully vapor-tight oiler is necessary to keep oil from leaking out. Body and shank are machined from solid bar stock. Both models have a threaded screw cap which is gasketed to prevent absorption of acid fumes or other vapors by the oil. The cap is attached by a ball chain to the inside of the gauge body to prevent dropping and loss. 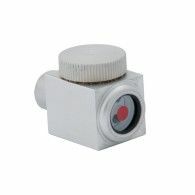 Sight glass is securely gasketed, and backed by a white enameled reflector to make oil level more readily visible.